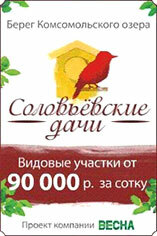 Looking for a land site in the Leningrad region, Russia? Whether you need a plot of land for construction, for building a cottage village, a private villa or a country-house, we have multiple offers for you. What characteristics make land sites of Sistema LLC exceptional? What types of land sites do we offer? Legal support throughout the purchase process and unique locations of the land sites guarantee you a safe investment.